This week’s topic is about the effects of RADIATION and MOBILE PHONES, FLYING and the effects that radiation has on our brain in conjunction with possible long term effects. We know that phones emit radiation, but the use, the practicality, the addiction that we have to our phone, is far out weighing the risks that we are not even allowing ourself to think about. Children and babies are now starting using these devices at a very young age to pacify them. Gone are the days of the dummy and hip hurrah to many that are using the tablet, mobile or internet device to satisfy the little ones from creating a fuss. We see this all around us but I want to challenge us to stop and take a closer look at the possible consequences to this daily radiation and the long term effects that it may have on us with prolonged use. You can also be exposed to considerable radiation up in the air as we are closer to the ozone layer and the sun. To help combat this kind of radiation then all we need to do for added protection is to consume more ginger and lemon balm. Ginger phytonutrients help. So steep your ginger and drink up in the morning. Lots of plant products have been used to help reduce the effects of radiation. Such as garlic, turmeric, goji berries, mint leaves. Tested on people that were exposed to radiation like pilots and the hospital workers that run the x-ray machines. These people also had high levels of oxidative stress. By just drinking 2 cups a day of the antioxidant lemon balm tea, (the science – It has been know that acute exposure to ionizing radiation (IR) results in immediate formation of free radicals in living systems that last a matter of milliseconds leading to oxidative damage to biomolecules such as DNA – we don’t want that! Just 2 cups a day of the lemon balm tea – the level of free radical damage went down. Due to the antioxidant properties. Its believed any plant will do the same. This works too when flying so whilst sucking on some ginger sticks to stop nausea when flying will also protect you from the radiation damage of flying 🙂 we like that. Research shows the damage that the radiation can do to our brain. 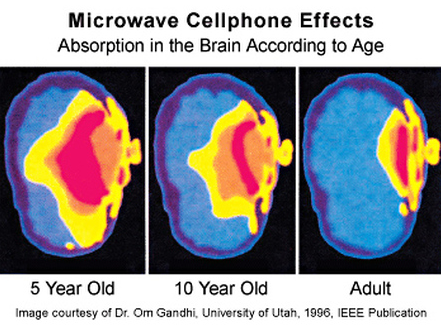 Microwave transmitting devices can reduce the amount of cells in a newborn baby in memory and brain cells that will affect their learning later in life. Tests on rats show that prenatal exposure to mobile phone radiation the newborns took 3 times as long to get out of a maze for food than the non radiation newborns and it took them twice as long to do the tasks. They also tested sperm with mobile phone radiation. So it measures viablity, and mitochondria damage in the DNA. So don’t pop your phone in your pocket and put it on airplane mode when you do not need to use it. India already advises men to not put the phones in their pockets due to low sperm count. This is then connected to the risk of brain cancer. When picking up a call you want to ensure that the phone doest not go straight to the ear as the most radiation is when you first pick up as it needs the most power to get the call though. So watch out for Prenatal exposure, fertility, lower testosterone, increased risk of DNA damage and offspring will have lower fertility too so it gets passed down the line. Breast is also affected due to fat and fluid, which are in the breast – so again do not put the phone anywhere near the breast. 4 hours a day in the bra for 10 years a 34 year old lady developed right under the antenna of the phone. This can apply to men with unusual cancers too. Tiffany France developed metastatic breast cancer at the age of 21 and it outlined the phone, right under the surface of the skin. Not deep in the skin. There are 38 reported to date. So the risks are there. These women had no genetic cancer exposure. Mice that were prenatally exposed as mice had worse memory, more hyperactive, more anxiety and less fear. Shocking right! THINGS TO MAKE YOU THINK OOPS…. Ok so lets take a closer look at radiation. So we know now that we have increased risks from radiation from mobile devices, but we also know that flying due to the cosmic rays from out er space at hight altitudes, just one round trip, cross-country form one side of America to the other may be subject to the same level of radiation as a chest x-ray! We also get radiation it from CT scans, CAT scans, also using multiple x-rays from different angles to create cross-sectional images. This exposes is to 100’s more radiation than a simple x-ray. DID YOU KNOW that there is an increased risk of cancer after a single CT scan which experts are saying could be as high as 1 in 150 for a baby girl. From studies done to date. DID YOU KNOW that the diagnostic medical radiation dealt out in one year is estimated to cause 2,800 breast cancers among woenen as well as 25,000 other cancers. Which means that doctors could be giving us cancer. DID YOU KNOW that getting a chest CT scan is estimated to inflict the same cancer risk as smoking 700 cigarettes? One iin every 270 middle0aged women may develop cancer due to a single angiogram. These x-rays can be life changing but take heed and think twice before being exposed. Can an MRI be safer or simply not performed at all. But the great news is that tests on pilots revealed that consuming the most vitamin C and vegetables and fruit appeared to protect them more. It was also shown that a mix of phytonutrients from foods such as citrus, nuts, seeds, pumpkins, and peppers had the lowest levels of DNA damage in response to the radiation they were bombarded with every day from the galaxy according to Dr Michael Gregors findings from studies done. Even studies from people exposed to the attacks on Hiroshima and Nagasaki. Those that ate abundant vegetables and fruits cut their cancer risk by 36%. However egg and fish consumption was associated with significantly increased risk of DNA damage. Also included in the damage from animal products were the role of animal fats in free radical formation.